For a long time, racers have known that one of the best things to do to an engine to improve its performance is to stabilize the ignition timing. The MSD Flying Magnet Crank Trigger system does exactly that by using four magnets embedded in an aluminum wheel. Although similar in appearance to other crank triggers, the MSD Flying Magnet design works on a different principle. Most crank triggers have a wheel, with steel studs sticking out, bolted to the harmonic balancer. As the crankshaft turns the studs pass by a stationary magnetic pickup, triggering the ignition. This pickup can be triggered by other bolts, debris or even vibrations which will cause a loss of power or engine damage. The MSD Flying Magnet Crank Trigger uses four magnets secured in the aluminum trigger wheel that pass by a stationary non-magnetic pickup to trigger the ignition. This “flying magnet” design produces accurate trigger signals and the non-magnetic pickup cannot be false triggered. Each Flying Magnet Crank Trigger includes a two-piece mounting bracket for the non-magnetic pickup that in most cases will work on either the passenger side or driver’s side of the engine (the SB Chrysler and SB Ford brackets mount on only one side). The CNC-machined aluminum bracket securely holds the pickup in place and is slotted to provide a wide range of timing adjustment. Spacers are included so you can mount the bracket on engines with standard motor mounts or engines with a ¼” motor plate. 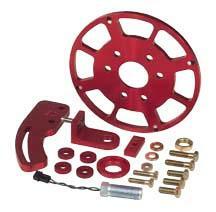 These systems will trigger MSD 6, 7, 8 and 10 Series Ignitions and all MSD Timing Accessories. Racers have always been inventive and willing to fabricate the parts they need if nothing is available. Building a crank trigger system is not an easy task but there has been an increasing number of unique front hub systems and distributorless ignitions that require one. MSD’s Universal Flying Magnet Crank Trigger Kit will give you a head start in fabbing a custom kit for your application. This kit is supplied with everything you’ll need to get you going in the right direction. A 7” billet aluminum wheel is supplied that has magnet positions for 4, 6, 8, 10 or even 12-cylinder engines. An oversized bracket arm is supplied that can be cut down to your specs and an “L” shaped holder is also supplied that can be machined for the ¾” or 3/8” pickup.